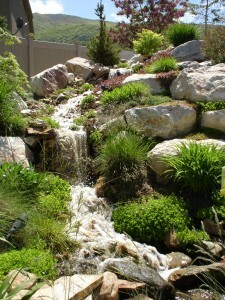 Whether you’re looking for a cascading waterfall, a pond, a pondless waterfall or water feature, a beautiful natural stream with cascading waterfalls, a pool, the surrounding ground cover, custom landscape, or a new patio to surround a water feature, Pebble Creek Landscaping has you covered. Located in Draper, we can build your koi pond complete with water plants, streams, and then surround it with your choice of wrap around patio or garden. Not sure if you want it to be a rock garden or a flower garden amidst ground cover? Worried about water costs? Don’t be. 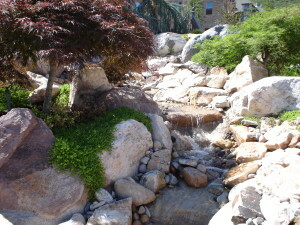 Pebble Creek Landscaping is water conscious in this desert climate. We use only the most water efficient options to keep your costs under control. No matter your choice, let our specialists walk you through it. Furthermore, we can easily incorporate any form of garden or patio next to your pool and take it to the next level. We can beautify your area by using a specially tailored mixture of mulches and soil conditioners to help you conserve water, control unwanted weed germination, and amend your soils. This means your soil will have premium growing conditions for your plants, flowers, and trees. This also means you aren’t losing money on overwatering your landscaping. Have a nasty slope in your yard? Let us build you a retaining wall or a decorative sitting wall next to your flagstone patio and pool to give you more usable space. Want to illuminate your new custom built pergola gazebo with landscape lighting? We can help you. Your Utah landscape should be a peaceful and beautiful place to enjoy time with your family and friends. Your landscape should be a place where you can read a book, nap on a hammock next to your new pool, and spend quality time with your family. It should be a beautiful place with visual accents from all areas. It should be so beautiful that even when you’re inside you’ll want to open your window to hear the soothing sound of running water. Sounds amazing, doesn’t it? You’re ready for your new landscape – and we can make it happen today. Pebble Creek Design specializes in custom landscape design and installation. 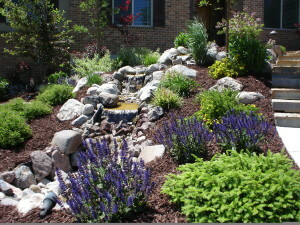 With almost two decades in professional landscape we are confident we can achieve and exceed your landscaping desires. "We want to thank Andy and Pebble Creek Designs for a wonderful job landscaping our art gallery in Midway..."